My Dad enjoys using the workshop he built. 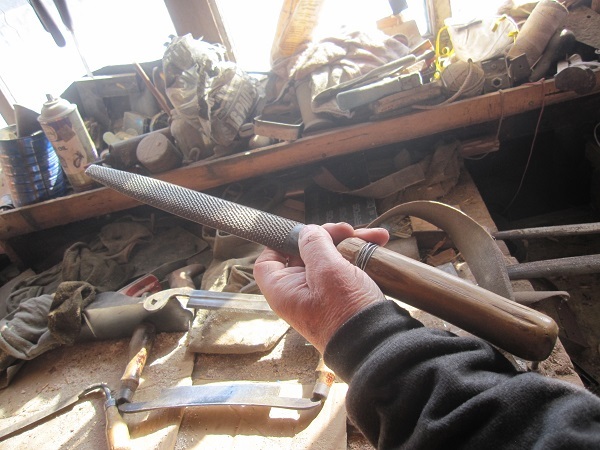 He likes using hand tools and taking his time to create his own ax handles, wooden mallets, splitting wedges, hearth brooms, and other handy objects. His workshop sees a lot of action when my Dad isn’t in the garden! 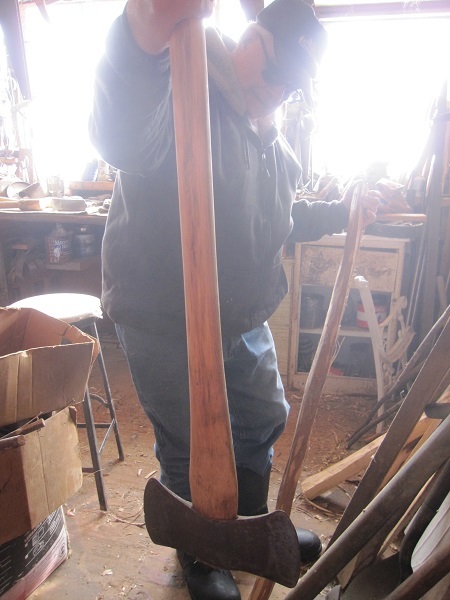 He likes to buy ax heads at flea markets and then makes new handles. 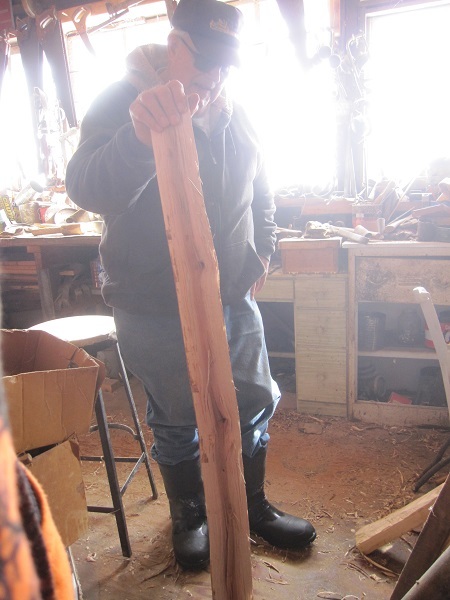 Last week I visited with my Dad and got a tour of his workshop and some first-hand demonstrations of how he makes canes and walking sticks. 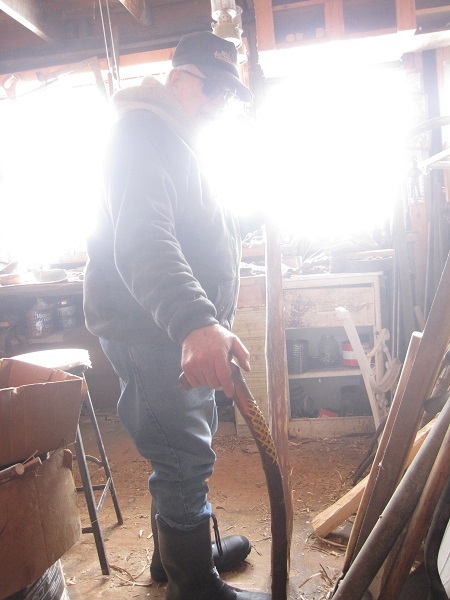 You can read the instructions for how he makes them from saplings he harvests from his woodlot in my article DIY Cane or Walking Stick on my new website The New Homesteader’s Almanac. 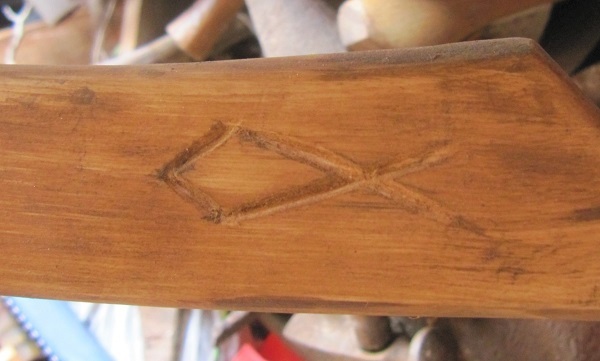 This piece of wood will most likely be made into an ax handle. He has all kinds of raw materials on hand, along with ready to use ax handles, finished products, and the tools he uses for creating them! My Dad likes collecting tools, salvaging materials, and repurposing things to fit his projects. Oh sure, he likes new tools too! 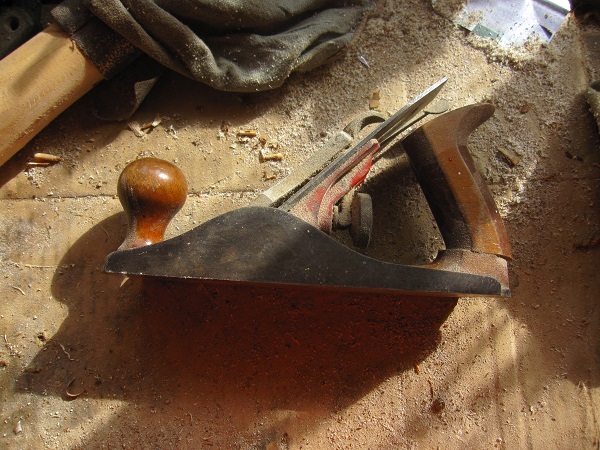 But he has a much deeper appreciation for hand tools that have a story behind them. 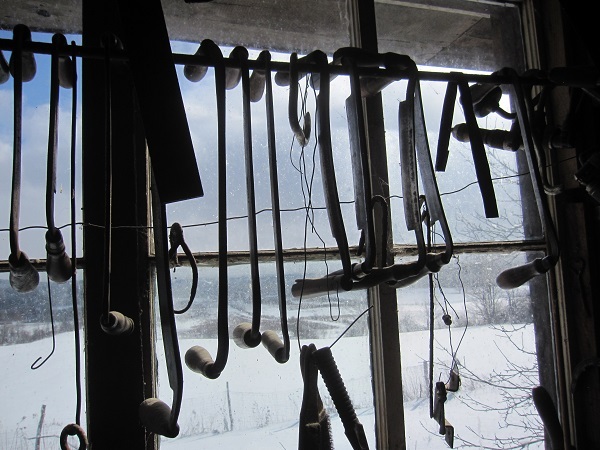 There’s a lot of history in his workshop and a lot of raw materials in case he starts a new project. The barn and workshop were built from salvaged materials and my brother helped him with that project. That barn has lumber from other old barns that my Dad tore down. Some of the wood came from an old horse barn. I remember being a kid when he tore that barn down, salvaged the lumber, and hauled it home. He’s gotten a lot of use out of that horse barn that was falling into disrepair. The first plane my Dad ever bought. You can see a bit more about it in the video below. 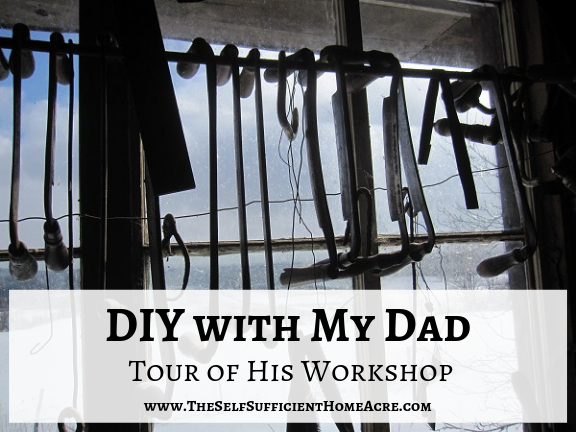 I have some videos on my YouTube channel from my Dad’s workshop too! In this video he shows us the first wood plane he ever bought, his drawknives, and sharpening stones that he uses for different purposes. 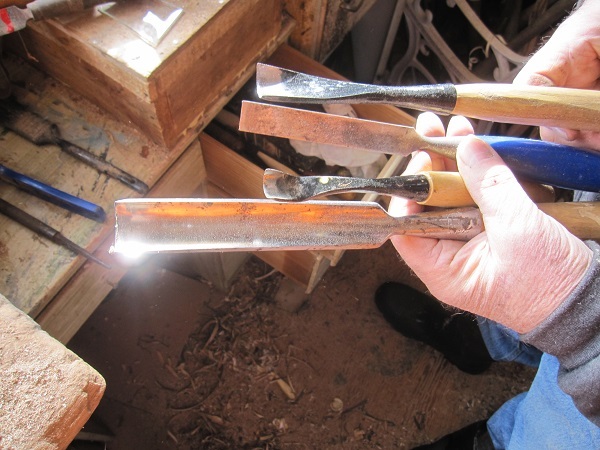 He has a pretty impressive collection of drawknives for different purposes such as removing bark and shaping wood. There’s a whole drawer full of sharpening stones in his workshop, ready for any dull blade he picks up. 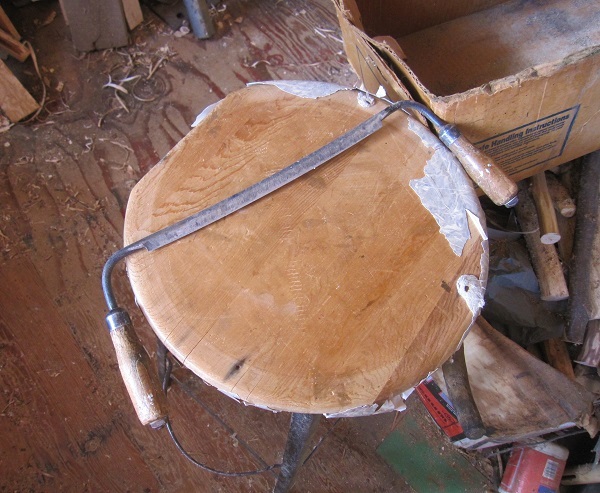 A drawknife purchased at a flea market. The workshop is stocked with a lot of files, rasps, and carving tools that he puts to good use on his homemade projects. 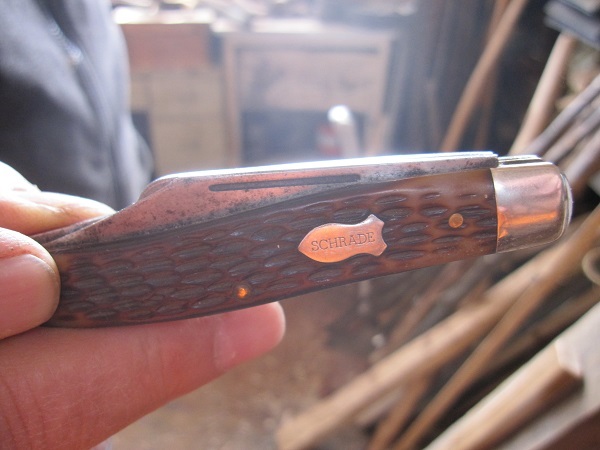 Many of them have handles he created, like the one below. He’s been picking up carving tools whenever he sees them for a decent price. 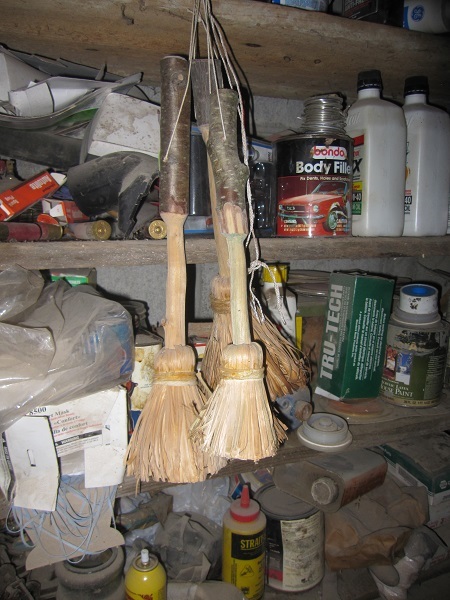 These ones are used for shaping wooden spoons and other handmade objects. 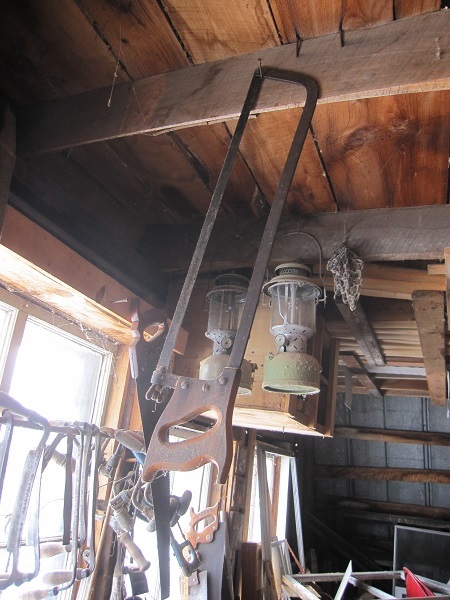 Here is the meat saw my Great Grandpa used for butchering pigs on the farm! Meat saw that my great grandfather used for butchering pigs. Quite a few people have benefitted from my Dad’s creativity. 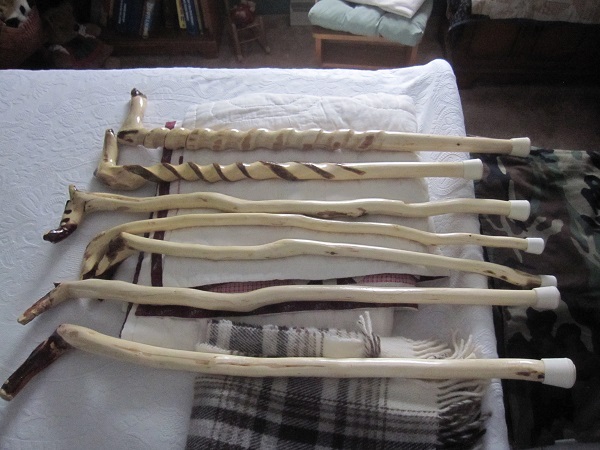 He gives canes and walking sticks to his family, friends, and he also donates them to fundraisers. The American Legion chapter he belongs to has raised money from his walking sticks. 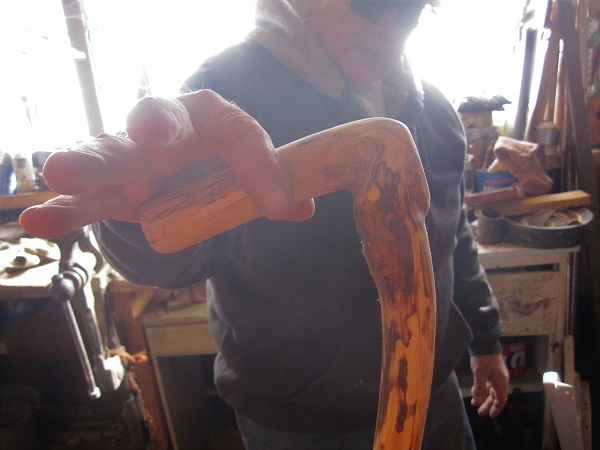 This is a cane he is working on. He has quite a stash of canes on hand for donations or anyone who needs them! These are canes my Dad has made for giving away. 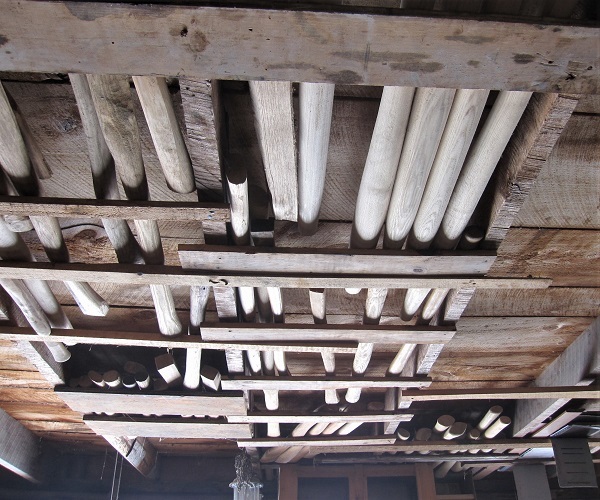 There are some canes in his workshop, along with all kinds of salvaged and raw materials. 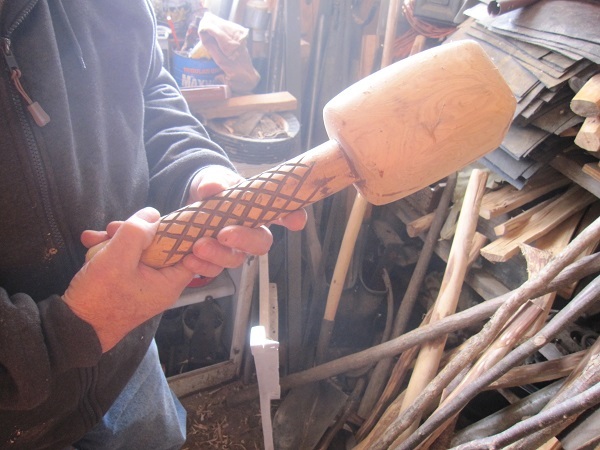 Handmade wood mallet…he’s good at this stuff! 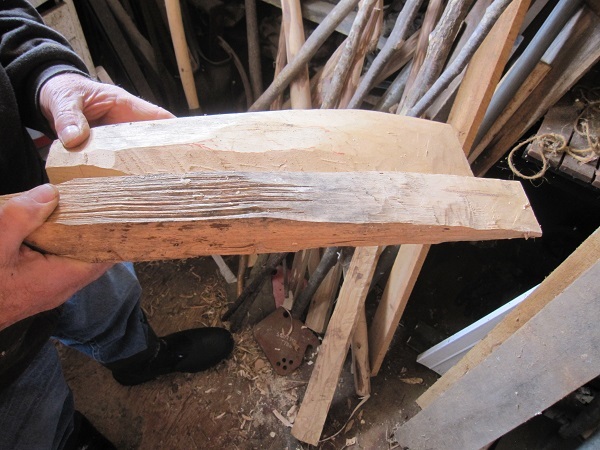 Simple wedges he uses for splitting wood. 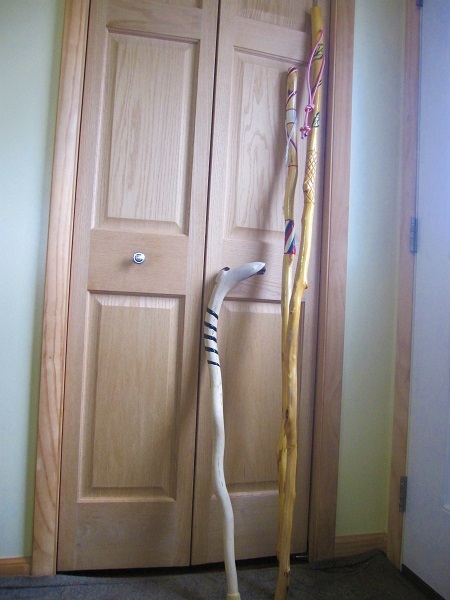 Walking sticks and a cane Dad made. I used the cane before and after my hip replacement surgery! I’m glad to have handmade things that my Dad has given me! You can also read about the canning cupboard he made for me. I had a nice visit with my parents and my inlaws! 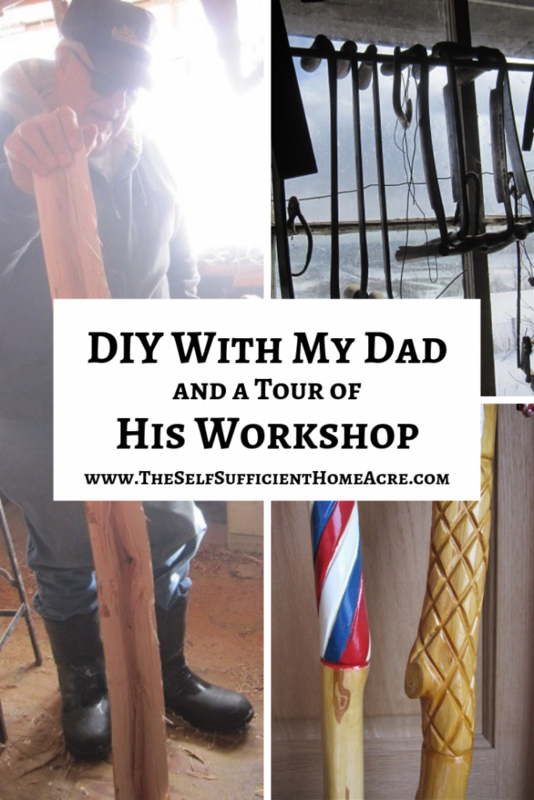 I hope you enjoyed this tour of my Dad’s workshop and some of his many creations. You may also see photos of the area where I grew up in my post, Visiting Family in New York. What an awesome post! We have dreams to have a workshop like your dads one day! Thanks for sharing! Thank you, Tamara! I hope you get your workshop. 🙂 It’s so nice to have a space for making things! What a wonderful memory to have of your father for the future! Treasure those memories Lisa because one day those will be memories you will be glad to have! 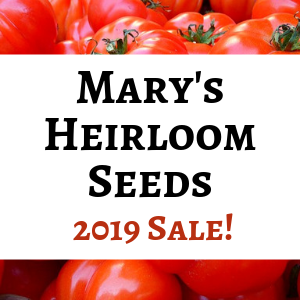 Very true, AnnMarie…thank you for the reminder! Reminds me of my husband workshop. It is their happy place. Beautiful! Your dad and my hubby would be great pals if they lived closer. Mine also collects tools and does woodworking. Woodworkers are a gift. Hi Maria! That’s great! I always enjoy seeing the things that people make by hand. 🙂 My Dad is pretty talented and he loves to talk about his hand tools!